We at BellaTEX believe the dealer plays a vital role in the delivery of an overall high quality product, a positive customer experience, and uncompromising customer satisfaction. Without the dealer, who can visit the customer and the job site in person, there is no plausible scenario for consistently delivering the best possible product. Private Labeling: Our standard labeling option features the dealer’s name/logo and contact information so the customer knows where to return for future purchases and support. 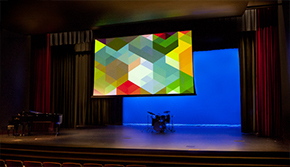 Training: With the many different fabrics, FR ratings, rigging methods, features, customizations, measuring challenges, and different ways stage curtains get to market, there’s a lot to know. To make sure our dealer’s sales and installation staff are the best in the business, we offer a variety of training opportunities both at your location and over the web. We also offer toll free telephone support, and access to ETCP certified riggers. Fast Quoting: We know that your customers want to know the bottom line fast. BellaTEX offers an online quotation system so you can get the price you need instantly day or night. It’s even optimized to run on your iPad and iPhone. For personal service you can call and speak directly with a knowledgeable salesperson, who can answer questions and will typically provide a written quotation within a few minutes. Or you can email your request and receive a quotation within a few hours. We can also do take-offs of bid plans and specs for you and typically return pricing within a day or two. Lead Referrals/Advertising Assistance: BellaTEX runs various advertising programs geared toward end users. Sales leads are directed to local dealers for followup. BellaTEX also offers shared expense advertising programs to generate additional interest in your local market. Fabric Selection: We offer a full line of velours, muslins, scrims, cycs, spandex, and other specialty fabrics. Rigging: We will quote you a complete curtain system inclusive of tracks and rigging, or you may provide tracks and rigging of your own. Quality: What’s the most important drape we’ve ever sewn? The one we’re working on right now. Regardless of who the drape is for or where it’s going, every product is made to the very highest quality standards. You will find the most common consultant level features are part of our standard offerings. BellaTEX, Inc. stands by our products with a 2 year warranty on materials & workmanship. That’s twice the industry standard. We don’t just make a product we’re proud of, we make a product you’ll be proud to have your name on.